Planetary Society India with a view to inspire the future cosmonauts, astronauts, Scientists of the county is happy to commemorate the 25th Anniversary of Rakesh Sharma’s maiden space flight on 3rd April, 1984 13:08:00 UTC. This was First time and the last in recent past when a Indian Citizen was Launched into Space. Whereas Kalpana Chawla, Sunita Williams were other two person of Indian origin to go into space. Rakesh Sharma spent 7 Days 21 Hours 40 Minutes. Rakesh Sharma conducted an Earth observation program concentrating on India along with life sciences and materials processing experiments during the mission on Salyut 7 Space Station of Soviet Union. Historic Words “Saare Jahan Se Acha” – Indira Gandhi : Society on this occasion likes to remember the answer of Rakesh Sharma when the then Prime Minster Smt. Indira Gandhi asked him how India looked from space. He said “Saare Jahan Se Acha”. Society with a view to inspire the future scientists, space explorers of the country hereby makes an attempt to capture the Historic mission through www.indonaut.blogspot.com . Society hopes this would serve has easy reference with all information at one place pertaining this mission. Further over next seven days efforts would are on to publish new set of articles along with information on the plans of the country for a manned mission in year 2015. School/College Kit for Students : Further as part of its celebrations society has prepared a kit consisting of images, video, PowerPoint for schools/college to create awareness about the historic effort. Already society distributed the kit to 100’s of Schools across the country using internet technologies. Society requests Student, Teachers to visit www.indonaut.blogspot.com and download the kit and conduct awareness sessions in their respective institutions. 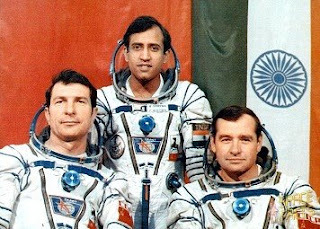 Look at the left side (chest) of Rakesh Sharma in the above photo you will find the Mission patch with above insignia. Request : In Coming years country needs great number of scientists, importantly space explorers for its missions. Hence Society requests parents to pledge their support and promise to make earnest attempt to inspire the future space explorers present in the house. Kindly visit www.indonaut.blogspot.com for indepth information and other updates over next few days.